Harley-Davidson Denies Unlimited Milage Warranty Claim On Bike With 2.5 Million Miles. He’s ridden his Harley Davidson motorcycle for more than 2.5 million miles – most likely more than anyone else in the world. But now, this Marine Corps veteran is fighting the very company he loves so much. “If you initiate that wave, you’d be surprised how many people return it,” Dave Zien said. As he rides his Harley-Davidson across the country, Dave Zien is constantly getting noticed as his flags on his bike flutter in the wind. “Very, very few people give me the finger and when they do I say ‘God bless you’ or I’ll give them the Harley hallelujah with both hands high in the air,” Zien said. Now, the Marine veteran, who has ridden more than 2.5 million miles on his Harley-Davidson is giving the iconic company the “Harley Hallelujah”. “I mean Harley-Davidson, this is ludicrous. The mystique and heritage of Harley Davidson is suffering,” Zien said. While he was riding in Dallas in March, Zien’s clutch went out. So he made a claim because his bike is under warranty. “They tell me ‘Because you fly flags, your blocked. Your blackball listed. You could never get any warranty work – which is unlimited mileage for seven years because you’ve been flying flags’,” Zien said. Zien’s flags are held by mounts attach to his bike which Harley-Davidson believes cause drag on the engine and transmission. In addition to that, the mounts that hold the flags are not Harley-Davidson products – so they denied his warranty claim. “For heaven sakes! They were put on by a Harley-Davidson dealer and technicians. So that null and voids the argument,” Zien said. 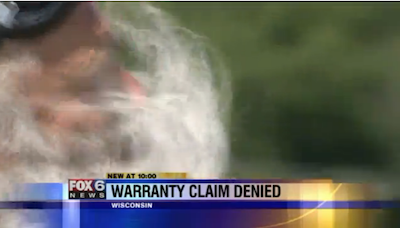 Even though Zien isn’t getting his warranty honored for this claim and is unhappy with the decision – he’s still a Harley-Davidson man. “Ain’t nobody – ain’t nobody going to stop our flags. Not even corporate Harley-Davidson. Were going to continue flying flags,” Zien said. Girls With Some Of The Longest Tongues In The World – Would You Date Her?